John 5 has just released his newest solo album and as always, he is keeping his fans on their toes. This is a musician who continues to peel away creative layer after creative layer, almost re-inventing himself each time. 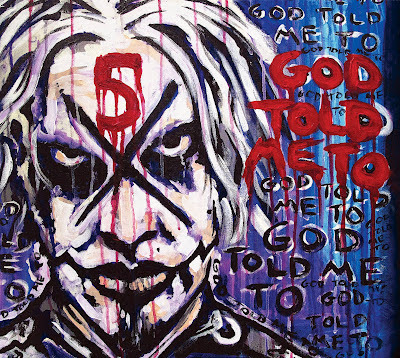 God Told Me To is his newest solo effort and it’s a feast for the senses. If you think you knew everything about this guy, this album will prove you wrong. The album was produced by John 5 long with Chris Baseford (Rob Zombie/Tommy Lee) and Bob Marlette (Sebastian Bach/Black Sabbath). It’s is an all instrumental effort with John 5 playing all instruments with the exception of drums. The first track, “Welcome to Violence”, opens with a lady saying “Play the guitar, play it again my Johnny” and then the crash of the strings as the assault begins. How does a mere mortal riff like this without peeling the skin away from his fingertips? What a way to open the album! His cover of Michael Jackson’s “Beat It” is up next and was released digitally about a year ago, so I am sure a lot of people are already familiar with it. John 5 pays tribute to the great Eddie Van Halen but laying down a spot-on recreation of his solo on that song. I thought it was a very nice touch by John 5 to do so, instead of re-working the classic solo and taking away from its legacy. The first surprise comes on track three entitled “Ashland Bump”, as it’s an acoustic, bluesy number. A great change of pace and styles and is one mother plucker of a song. “The Castle” is another acoustic number and shows that John 5 can shred acoustically just as he does electrically. I don’t think I have ever heard a musician play an acoustic guitar so fast. “The Hill of the Seven Jackals” head back to familiar ground for fans and the shredding is back at full force. One of more interesting tracks on the album is the Spanish flavored “Noche Acosador”. I almost felt as if I was watching a Quentin Tarantino and a bunch of outlaws were sitting around a table, exchanging stories with this music being the accompanying track. I love this track and two major thumbs up for John 5 stepping outside of what is probably expected on a solo album of his and do this song. The last two tracks, “The Lie You Live” and “Creepy Crawler”, are acoustic numbers that are the complete antithesis of songs such as the album’s opener. Each of these tracks show a side of John 5 that is such a drastic departure from the kabuki faced axe warrior that we see alongside Rob Zombie on-stage. These tracks are beautiful, somber compositions that show the diversity of a truly gifted artist whose guitar is an extension of himself. These two tracks totally blew me away and just added another layer this insanely talented and gifted artist. So, this new solo effort one half acoustic and half electric and switches back and forth on here. John 5 is becoming one of the guitar greats of this time. He is influencing a whole new generation of guitar players and this album will be a great eye and mind opener for many of them. Don’t be afraid to try new things and expand yourself as an artist. It’s a key in maintaining longevity in the industry today. This album tapped into several new keys in his guitar arsenal. What will he do next?